With the financial con game gaining a bit of artificial credibility over the past few weeks, the two sectors now that are down are my equity short (NYSE-SH), and my short against junk bonds. I wished I could believe the fairy tales told by our ruling elite. But if you are a regular reader of this letter, you know I can’t bring myself to drink the Kool-Aid and you will also understand why. For sure some of my comments this week are consistent with my views which are most certainly almost identical to those of David Stockman. 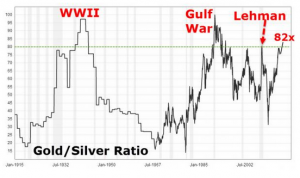 One of the revealing factors that suggest trouble ahead is the historical rise of the gold to silver ratio as you can see from this chart which recently reached a ratio of 82:1.0. The historical norm is 55:1.0. 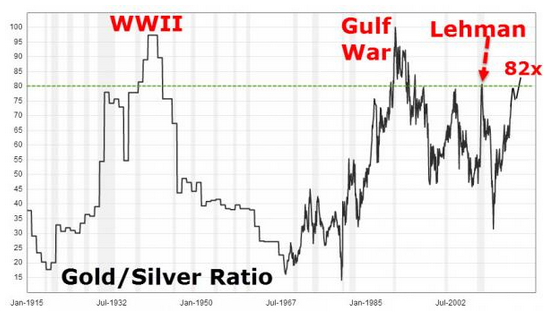 As you can see the ratio approached 100:1 during WWII and actually touched 100:1.0 during the Gulf War. 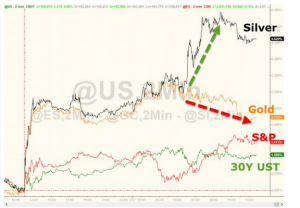 When gold rises so dramatically against silver it usually means there are some stresses in the system that cause big money to move toward gold because they fear financial assets that are backed by nothing may not survive. 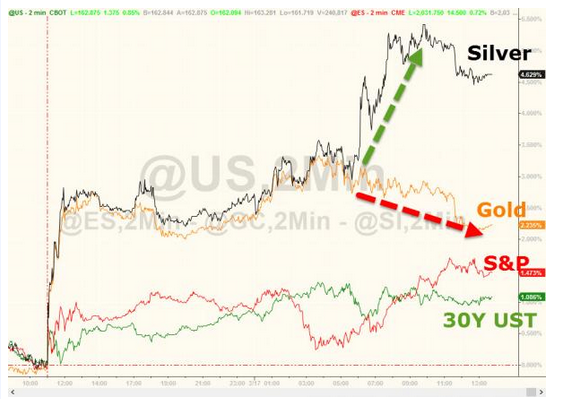 What is interesting is that this past week when the Fed went soft showing that it was not going to raise rates even though based on prior “data dependent” propaganda it said it would, there was a sudden decline in gold’s value relative to silver as the chart below demonstrates. What strikes me is that the Fed in “going soft” sent a signal (at least in the short run) that notwithstanding the Fed’s rhetoric, the economy is not strong and that it will print as much money as necessary to keep the banking system from tanking again. That may have taken some pressure off the financial system for now, and it may presage a turn to “helicopter money” in which we could be on the verge of hyperinflation as John Williams suggests. In that case, poor man’s gold may indeed stage a prolonged comeback and our silver stocks may then surge ahead of the gold mining shares on my list.